I had this little plastic cup with the mantis egg in it. I looked up how they laid their eggs since I was curious how there was a bunch of eggs inside one mass. Apparently they lay their eggs in a "frothy mass" and when this mass solidifies it becomes a solid ball with a texture similar to a wasp nest. I woke up one day about 2 weeks later and there they were. I did not expect them to be so big, and there were so many! They were all scrambling around, and I'm really glad I didn't try to put it in my spare fish tank because they easily climbed up the side walls and were chilling on the roof of the cup, where my fish tank would have had holes that would be big enough to climb through. It's been too long without making a blog post, and I thought this would be a fun thing to share with you guys. 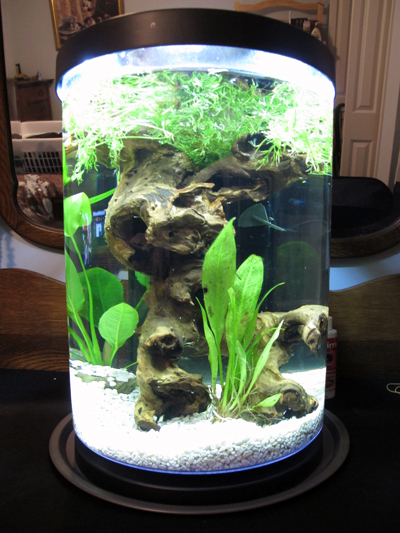 I'd been interested in aquariums and researching them for a while. One day I stopped by a local fish store just to check it out since I thought it'd be neat. The fish store was awesome! One thing that made me really happy is they had a few bettas (Siamese Fighting Fish) that they actually kept in community tanks with other fish instead of those ****py little cups like you usually see them in. My boyfriend was with me and we spotted a beautiful purple betta in one of the tanks (which by the way is my boyfriend's favorite color). We both fell in love with him and I decided to get a small tank. Praying Mantis Hatchlings Introducing, Roy!